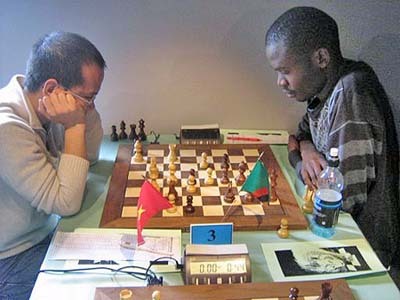 Amon Simutowe continues his march toward the final requirement for the GM title by coming clear 2nd in Rhône International Open in Lyon, France. He lost only to the winner, GM Vadim Malakhatko who scored 8-1. He drew with GM Jozsef Horvath of Hungary. Several of Simutowe’s games were one-sided as he punished players with quick defeats. This “Zimandola” is just too good. I knew Amon back in the days when Copperbelt Chess League was very active. Iam sure people still remember Tony Mwanza ( President CCLA). Amon you are are great and deserve it. I like your determination. fire burning we appreciate you sir. All the best in your Chess career. Congratulations with this 2nd place. You gained quite a few ELO-points. Steady going on and keep relaxed but keen.